What better way to educate the new generation of beer drinkers about the past than via beer? That's what Stone & Wood is doing with its Forefathers series, annual releases they'll create in conjunction with people they acknowledge as pivotal in beer's renaissance in Australia. First to the oche is Phil Sexton, co-founder of the Sail & Anchor, Matilda Bay and Little Creatures (not to mention the creator of the first ever American IPA and founder of multiple wineries) with whom they've conceived a beer that promises to teach a little about history too. 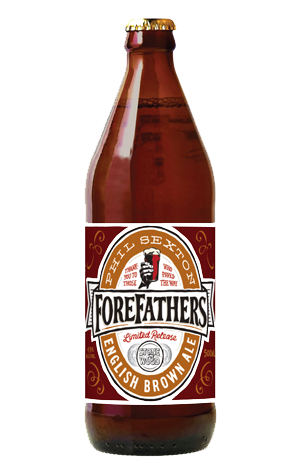 It's an English Brown Ale based on the styles made famous in Yorkshire that Phil enjoyed when studying brewing in the UK pre-Sail & Anchor. It's also one that brings his and Stone & Wood brewer Brad Rogers' shared talents as winemakers into play as they search for balance and subtlety in the beer. That's achieved in a chestnut coloured brew that melds a touch of jammy, woody, berry hops with some sweet, nutty malts and a balancing, earthy bitterness. One to sink by the pint while weighing up whether to grab pork scratchings or a pickled egg on your next visit to the bar.